Service animals help us in many ways during our daily lives. Dogs are natural helpers and love to be of service and with the proper training, they can accomplish some pretty impressive feats from rescuing people from burning buildings to helping manage PTSD and depression. Whether you want to do it for yourself or you want to give back to your community by training your GSD to become a service dog, it’s a wonderful and worthwhile thing to do. 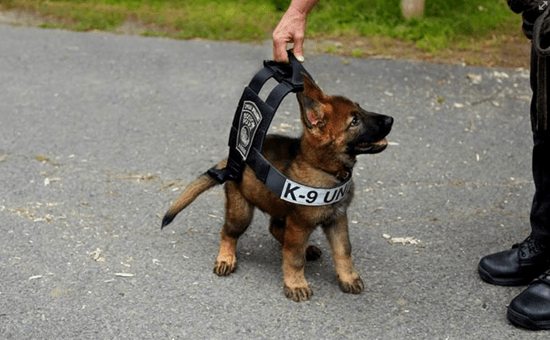 In this article, you’ll learn more about what kinds of service animals are out there, why the German Shepherd is a particularly good breed to train to become a service dog and finally, you’ll get some tips for how you can start training your pooch to be a hero! What Kinds Of Service Dogs Are There? c) Helping with daily tasks while the person is temporarily unable to do them. These are animals intended primarily to provide comfort to a psychologically or emotionally ill person. They don’t require specific training because the support they provide is more or less their natural love and devotion. These are a great help for the elderly and others who live alone. a) Therapeutic visits: dogs can be taken to retirement homes, schools, hospices, or even disaster areas to help console the people there. b) Animal assisted therapy: Animals can help achieve physical therapy goals such as regaining motion in limbs or improving fine motor control. c) Facility therapy: these are animals that live on the premises (usually nursing homes) and help people with disabilities. For example, they can help keep Alzheimer’s patients out of trouble and help manage other mental illnesses. As you can see, there are lots of ways that your dog can be of help to those in need! Even with minimal training, you can sign your dog up to become an emotional support or therapy animal if they are well tempered enough! 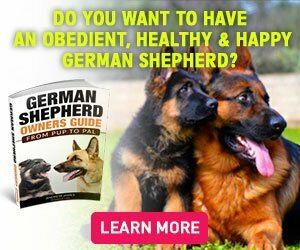 What Makes German Shepherds Good Service Animals? But many breeds can be used (although smaller dogs are not recommended for assisting with physical impairments). And they certainly do not have to be purebreds! Well-tempered: they should be very, very patient, gentle and calm. Whatever the disability a person has, a dog will need to have the patience to provide the proper support. A frantic, uncontrollable dog is going to find it difficult to focus on completing the needed tasks. No excessive shedding. This is mostly a practical concern and something that you can work on to some extent (such as brushing your dog regularly and adding more healthy fats to their diet). Well-socialized: the dog should be very comfortable being in many different environments, surrounded by many different kinds of people (young and old, energetic and calm, etc). They have to be very tolerant and adaptable. Obedient: training requires obedience. A dog will not learn what it needs to learn if it’s too stubborn to try. But bear in mind, if you’ve never tried to train your dog until now, you might not know how obedient it is so it’s worth a shot (and worth brining in a professional). These qualities can be found in many different breeds so it’s less important that you have a particular breed (and not important at all if it is pure or mixed). The important thing is that it has the right attitude and temperament to help others. Personal support: each person experiences a disability differently. When you train a service dog yourself or assist in its training, you can custom train it to help in the specific ways you need help. Give Back to the Community: if you train your dog to help others, you and your dog together can brighten up the world and give back to your community. This is an extremely rewarding benefit. Become more active: whether it’s taking your dog for a therapeutic visit to a nursing home or taking them to a home to provide some quality emotional support, it will get you out of the house and connecting with others in your community. Not only are you giving back, you’re getting back as well in the form of stronger community connections. Support your business: if you’re a physical therapist, you can train your dog to provide support and help to your patients. This will not only help speed up their recovery but it will make your practice stand out. Who doesn’t want to hang out with a dog while they recover? Whatever your reasons for training your German Shepherd to be a service animal, you will not regret it. These are helpful skills for a dog to have so it’s well worth the effort. That said, it can take some effort. Depending on what kind of tasks you want to train your dog to do, it can be difficult and in some cases, it’s better to go with a professional service training program rather than trying to teach these difficult skills on your own. Higher success rate: Professional trainers literally do this for a living. Better understanding of what’s needed: A professional will quickly realize if a dog is simply not suited to being a service dog. They will also better recognize when the dog is finished training or still learning (whereas a less experienced individual might believe training is done as soon as they start to see results). Essentially, it’s easier to get a better-trained animal out of program training than it is out of owner training (unless you happen to be a professional trainer). But that doesn’t mean owner training is no good. If you’ve got the dedication and the willingness to spend a lot of time and effort not just training your dog but researching the techniques to train them well, you can get a very well trained dog out of it. Custom training: You can train your dog to do the specific tasks you need it to do. More control: Make sure your dog is responding to your commands and that they are learning to work specifically with you. Raise and train your dog from puppyhood to adulthood: With program training, you have restrictions on when training can be done, which breeds can be used, and sometimes, the dog is even sent away to be trained and then returned to you. This isn’t necessarily a problem. But some people to prefer to raise their service dog from puppyhood so that they can enjoy and bond with the dog over its entire lifespan. If you have no experience (or no time/energy) to train a dog any kind of tasks, we suggest program training if you really want to make sure you get results. Training is not easy and not everyone is suited to it. It’s nothing to be ashamed of. It just means program training is probably better for you. If you have experience and you have the time and ability to dedicate yourself to training your own dog, we recommend doing it yourself. This lets you get the kind of customized results you want. Use official terminology: If you need to get your dog licensed as a service dog or you want people to recognize that you know what you are doing and that your dog is legitimately trained, it’s helpful to use the established terminology. Train in private first: It’s best to start training in provide, controlled areas. You can cut down on distractions, avoid conflicts and major problems, and it’s safer. Once your dog has shown major improvements in their skills, you can start training in public. 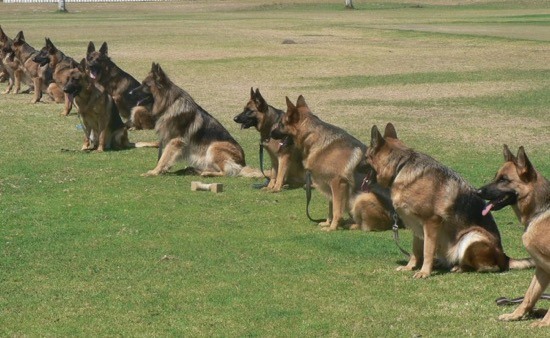 Public training: This is important for a dog that needs to accompany you everywhere. When they are ready, take them to pet friendly stores and parks. Take them to dog training schools, parking lots, busy intersections, etc. That is, when ready, take them to train in the places they will most often have to deal with when they are working as a service animal so that they are well used to these environments in advance. Know when your dog is ready: first of all, your dog should be fully potty trained and fully vaccinated. Next, before you put him in a position to be relied on as a service animal, make sure he is consistently (many, many times in a row without fail) performing the task as it should be performed. Until he can unfailingly do it without being distracted or stubborn, he is not ready. Training should be a positive experience: these are tasks your dog will be performing for life. So you don’t want him to have bad experiences with them. Keep training positive and enjoyable (without being lenient or a pushover) so that they enjoy the task. In other words, focus on positive reinforcement over negative (or at least structure every training session so that there is both positive and negative reinforcement). Set training goals: make sure you are progressing by setting specific goals for each training session. These should be realistic. Don’t set a goal like “I will train him to sit today.” Instead, have goals like “He will sit on command at least 50% of the time” or for public training, “He will perform the appropriate task on command at least 50% of the time despite distractions.” As your dog improves, set the goals higher. Track progress: this isn’t strictly necessary but it is very, very helpful. For each session, note what you worked on, what your training goal was, and what the actual results are. Also note anything you noticed during the session such as particular challenges the dog faced or tasks the dog seemed to pick up more easily. This can help you adjust future training sessions to better suit your dog’s skills and needs. 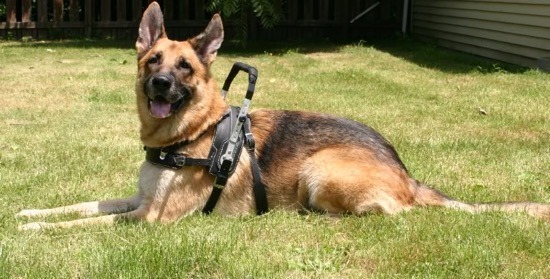 Train with Working Gear: service dogs typically wear a vest that identifies them as service dogs. This should also signal to your dog that he is working. Put this on right before every training session and take it off right after. Furthermore, do not let him play or socialized with other people or other animals while he is wearing it. Treat it like his on duty uniform. He shouldn’t be socializing or playing when he is on duty. So if you want to allow him to play and socialize, take the working gear off first. This helps him learn when he should be focused on working and when he can relax and play. Be consistent, patient, and dedicated. And be prepared for a lot of training sessions that don’t seem to show any results at the beginning. If you find that you aren’t up to the task of training, that’s ok. You can always switch to professional training. Proper training takes time, patience, and dedication (and sometimes money). But it is well worth the costs and effort because you will help your German Shepherd become the best dog it can be and give back to your community in meaningful and long-lasting ways.You’ll feel good. Your pooch will feel good. The people whose lives you and your German Shepherd will light up will feel good. It’s definitely one of the most worthwhile things you can do so if it’s something you are interested in, we definitely encourage it! You’ll feel good. Your pooch will feel good. The people whose lives you and your German Shepherd will light up will feel good. It’s definitely one of the most worthwhile things you can do so if it’s something you are interested in, we definitely encourage it!